Perfect size and great for any occasion! I used the boxes as favors for a baptism. I put white and pink m&ms. I wrapped the box with white and pink ribbon with a bow. In the middle of the bow I put a "thank you" charm. Super cute and unique. Everyone loved them. I always come to this site to purchase my favors. This was my third time. Product fit will with the theme. All good were received in impeccable condition and excellent time. 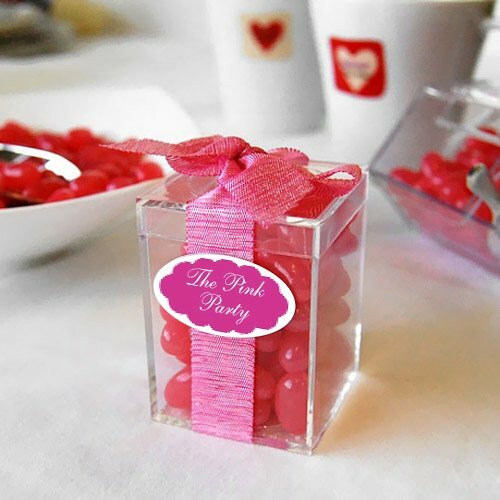 Need chic party favors packaging? The solution is crystal clear favor boxes, that is! Contemporary clear acrylic boxes are a great choice for showcasing party favors. Each clear box is made of durable acrylic plastic and comes with a fitted lid. These unique, reusable party favor boxes stand out because they stand tall. Rectangular rather than square, each measures 1.63"L x 1.63"W x 2.19"H.
Fill to the brim with flavor and add extra flair with personalized favor gift tags and personalized satin dots ribbon.